Clean and refresh the healthy way. This dual alpha hydroxy acid formulation (glycolic and lactic) helps cut through and remove excess skin oils, impurities and make-up, without leaving skin dry or irritated. 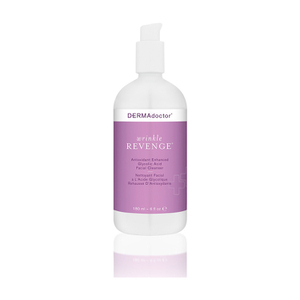 This refreshing toner promotes rejuvenating cellular turnover, helps remove pore-plugging oils and surface residue while imparting skin protecting hydration. Ideal for oily, blemish-prone, or combination skin. This formula is dermatologist tested & approved, allergy tested, hypoallergenic, non-comedogenic, free of soaps, oils, fragrance, dyes, parabens, phthalates, and gluten and has not been tested on animals. After cleansing, apply toner onto face with a cotton ball. Do not rinse off and follow with a broad spectrum SPF 30 daily. Aqua (Water), SD Alcohol 40-B, Lactic Acid, Glycolic Acid, Sodium Hydroxide, Polysorbate 20, PEG-8 Dimethicone, Glycerin, Panthenol, Butylene Glycol, Camellia Oleifera (Green Tea) Leaf Extract, Camellia Sinensis (White Tea) Leaf Extract, Chamomilla Recutita (Matricaria) Flower Extract, Citrus Limon (Lemon) Peel Extract, Allantoin, PEG-60 Almond Glycerides, Caprylyl Glycol, Sodium Hyaluronate, Carbomer, Nordihydroguaiaretic Acid, Oleanolic Acid. I have been struggling with acne all my life. tried a lot of brands. dermadoctor works really well! i combine this toner with cleanser and serum for acne prone skin! highly recommended !! !